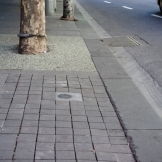 Since the early 1980s the City of Melbourne has been upgrading the footpaths in the central city from asphalt to sawn bluestone pavers. 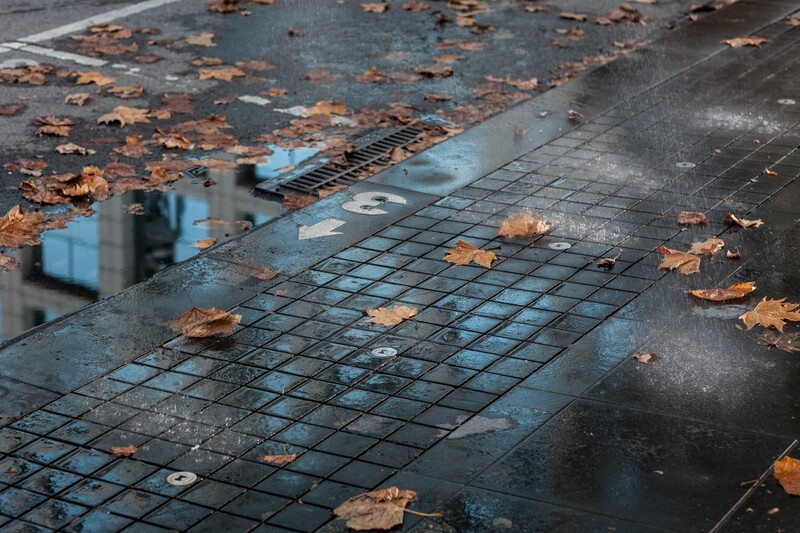 Bluestone paving is a defining element of Melbourne’s character. It is a durable and long-lasting surface that improves footpath accessibility, especially for disabled community members. However, standard bluestone paving is impermeable or sealed – it does not allow water to pass through. Rainwater collected on the paving flows into the drains and out to the Yarra River. It gathers litter and pollution along the way. We trialled a new approach to installing permeable bluestone, that allows rainwater to soak down between the pavers. This improves soil moisture and waters the adjacent trees. 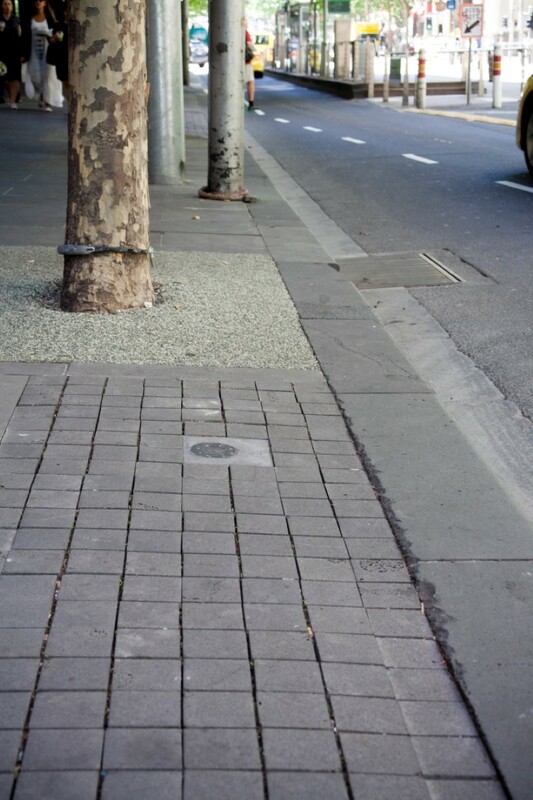 Since the successful Collins Street trial, we have installed permeable bluestone paving in several locations across the central city. What benefits has the permeable bluestone paving provided? Increased water flow to trees through passive irrigation. Improved soil volume and moisture for over 40 trees. 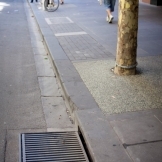 Reduced the amount of rainwater flowing into the stormwater drains. Typically, bluestone pavers are laid on top of a concrete slab. However, to create the permeable bluestone pavement, the pavers were laid on top of several layers of free-draining structural soil and sand instead. The pavers were laid with a permeable strip around them that was filled with fine crushed rock. This permeable paving was laid in a strip between the street trees, parallel to the road. Rainwater now hits the permeable paving, soaks into the soil below and waters the tree root systems. The permeable paving strip also intercepts water that runs off the non-permeable bluestone. It redirects water that would have flowed directly into the gutter and bypassed the trees. The permeable bluestone was installed between April and June, 2013. Delays occurred when asbestos-wrapped service lines were discovered in the excavation area. We also had to work around structural tree roots. It is useful to allow extra time for construction if it is likely that underground obstacles will be found. 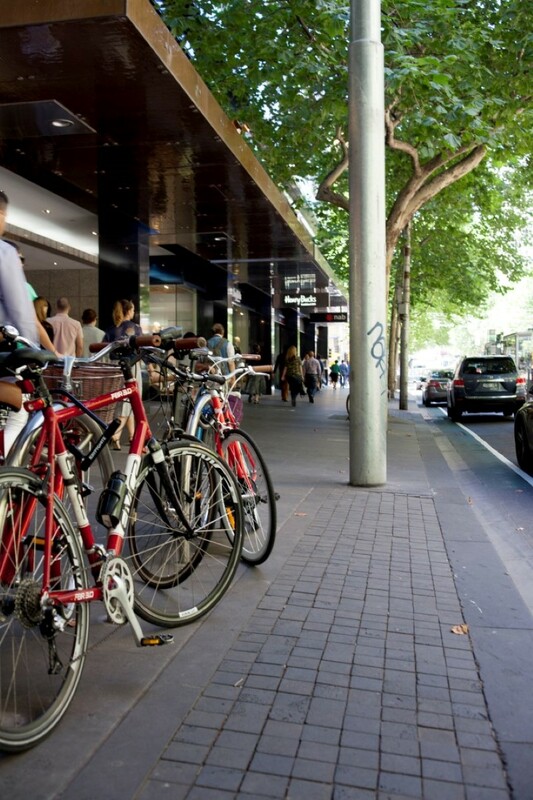 The streetscape redevelopment of Collins Street between Elizabeth and Queen Streets cost a total of $1 million. This included new street furniture and other upgrades, as well as the permeable pavement. 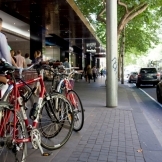 Melbourne’s bluestone pavements are made from basalt and are an integral part of the heritage and character of the city. It was important that alterations to the paving style respected this heritage. Typically, bluestone pavers are large oblongs that lie flush against each other. We created permeability by reducing the size of the pavers and creating small spaces between them. This style is similar to that found in some of Melbourne’s heritage laneways. A main objective for introducing permeable pavement was to improve the trees’ health, so protecting them from damage during construction was essential. It was important that the design and construction didn’t damage the tree root systems. We constructed the paving during winter, when the trees are dormant, to minimise the risk of damage. Typically, bluestone pavers are laid on top of a concrete slab. To create the permeable bluestone pavement, pavers had to be laid on top of free-draining structural soil instead. We removed the existing asphalt and dug an 850 mm-wide trench beneath the new permeable area. It runs between the existing trees, adjacent to the kerb. We filled each trench with sandy soil and covered it with geotextile and a layer of compacted crushed rock aggregate. The pavers then were laid on a layer of compacted, washed bedding sand. Finally, fine crushed rock was used to fill the gaps between the pavers. 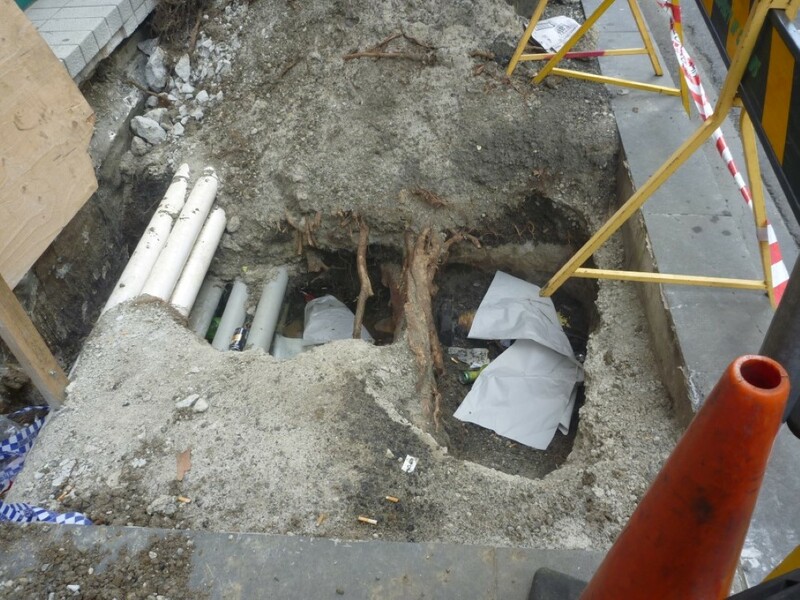 During trench excavation, the council arborist was regularly on site to assist the construction team in excavating around the tree root systems. To ensure the trees weren’t damaged, excavation was carried out by hand around the structural roots. We also used special machinery in the trench. Where roots held existing kerbstones, we left the stones in place and built the permeable installation around them. A specialist-pruning contractor pruned roots only when significant root damage had occurred. In some instances, structural roots had to remain intact and new service cables were threaded through the roots. An arborist should have been engaged throughout the construction phase. The City of Melbourne’s arborist worked on the project, but this took resources away from other work and caused delays. The arborist should also be able to prune roots. This would reduce the need for a specialist-pruning contractor, saving money and time. Sandy soil fills the base of the trench, to a depth of 300 mm. The soil is free draining (225 mm per hour). It can withstand the load of the pavers and pedestrians without shifting. Composition: Heicom tree sand is a combination of washed, semi-washed, semi-rounded silica sand and organics blended together. It is predominantly medium sand grains, with a combination of smaller and larger sand particles. It has a pH of 7.5 and contains about 5 per cent organics. A drainage pipe is placed at the base of the trench within the sand layer. 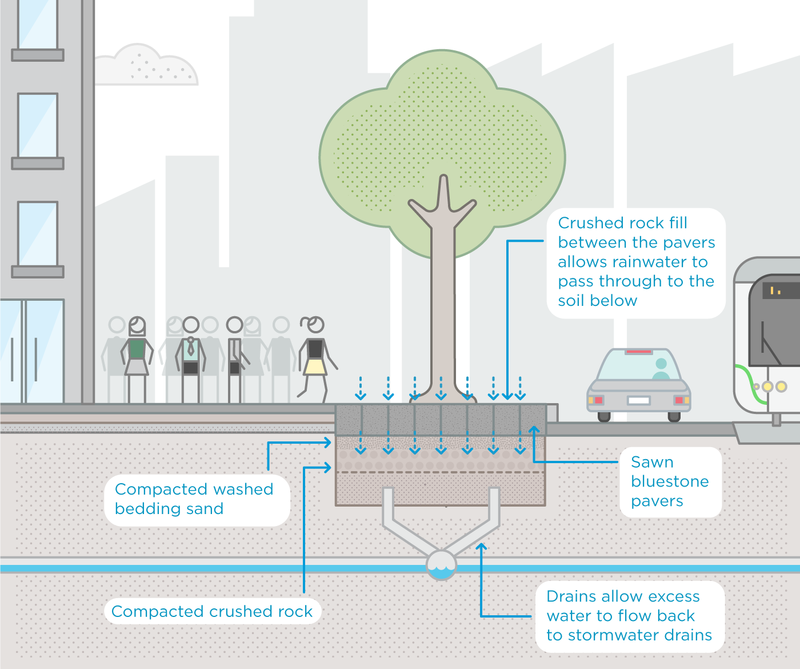 This allows excess water to return to the stormwater drainage network. It is one long, continuous pipe, running through the base of each trench and around each tree’s root system. 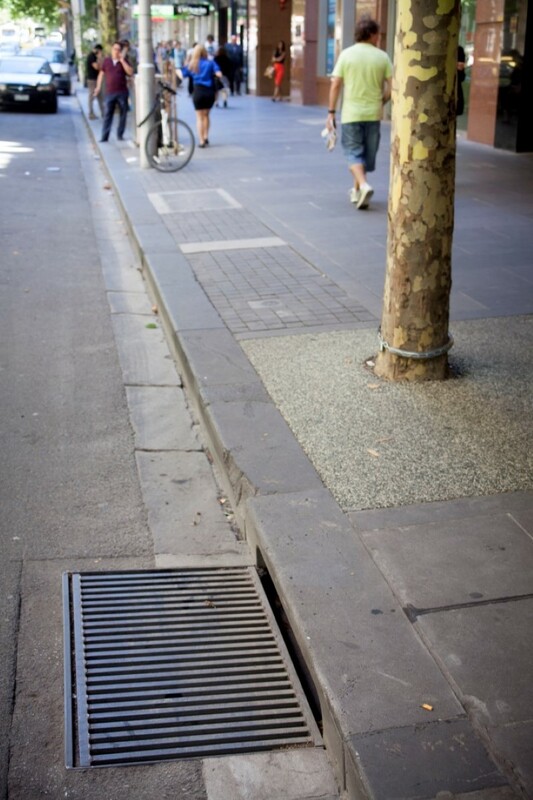 It then connects to the stormwater drain at the lowest point in Elizabeth Street. The geotextile liner fabric sits on top of the sand, separating it from the crushed rock layer above. This prevents the two layers from merging and helps to maintain the structural integrity of the trench. A 150 mm thick layer of crushed rock sits on top of the sand layer (separated by the geotextile fabric). The rock layer is a stable, fast-draining medium that can be paved over. The bluestone pavers are small cubes carves from basalt. Positioned on top of a 40 mm layer of fine bedding sand, the pavers are set in a checkerboard pattern with 10 cm space between each paver. The spaces are filled with crushed rock fill that allows water to pass through. The permeable bluestone pavement requires minimal maintenance. Over time, the material between the pavers might clog. Replacing or cleaning the crushed rock that separates the pavers can fix this. We could have delivered this project more efficiently if tree protection had been built into the process at an early stage. Protecting the trees on an ad hoc basis caused delays and extra cost. It would have been valuable to include tree protection as a criterion in the tender process.